Detroit Saxman Darron McKinney a retired Police Officer studied music at Southern University in Baton Rouge LA under the Legendary Jazz Master Alvin Batiste. After Leaving Louisiana, he returned to Detroit, quickly getting back into the mainstream. Among the artist he has shared the stage with are Ben Tankard,Angela Bofil,Pieces of a dream,Marion Meadows, Dizzy Gillespie, Max Roach, Jimmy Heath, Roy Ayers, Betty Carter,Joe Sample, Cuba Gooding Regina Belle, Mikki Howard and Waymen Tisdale. 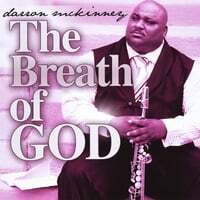 The "BREATH OF GOD" CD is a Breath of fresh chart topping Gospel favorites that will have you singing and praising with every heart felt singing note of this anointed saxophone player.